Boy: I am exhausted today. Looking forward to going home and doing nothing, hopefully, you’re up for the same? Whatever. It’s like you want to get your heart broken again. Whatever… just another reason we made the right decision. An interesting discussion on this topic: When did “Whatever.” begin to be used as a sentence? Notice that ‘whatever’ has other meanings. It can be used as an adverb, a conjunction, a determiner, or a pronoun. As a pronoun it introduces a relative clause and its meaning is: ‘everything‘; ‘anything that‘. For example: Do whatever he asks you to. As an adjective, it means ‘of any kind‘; ‘in any amount‘; ‘no matter what‘. For example, I saw no point whatever in continuing. Furthermore, we use it in questions as a synonym of ‘what’, but with more emphasis. For example: Whatever do you mean? = What do you mean? 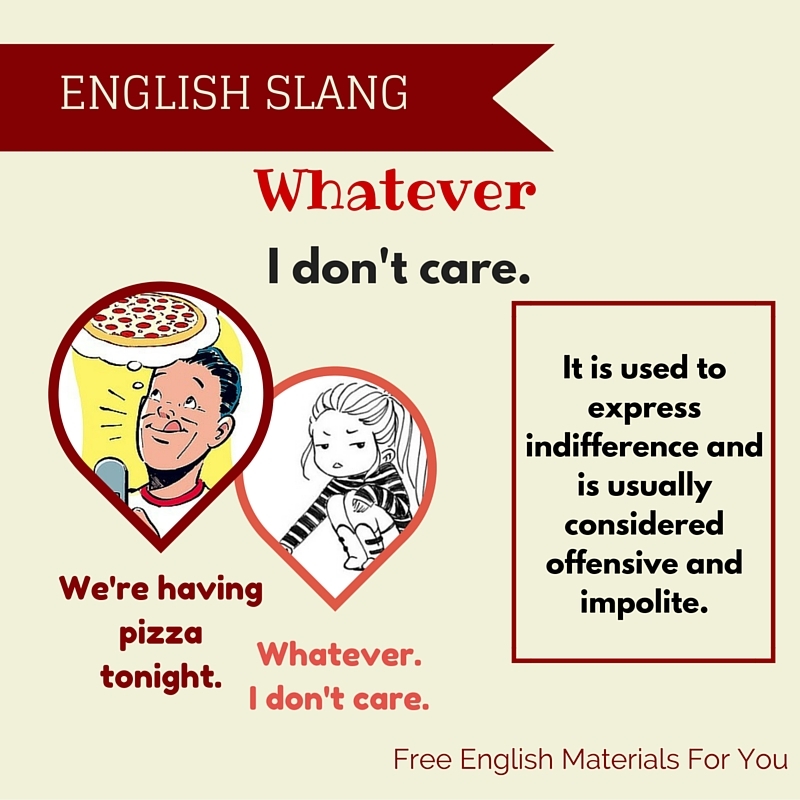 ‘Whatever’ is also used as a conjunction. In this case, it connects two clauses: I won’t go there, whatever he says. Previous Inane – What does it mean?